You wouldn’t think Tolstoy and proposal writing would have much in common, would you? But if you’ve read War or Peace, which is much easier to read than you’d think, there’s a few techniques in there that you can apply to your proposals. Summary – read the first three chapters in War and Peace. Notice anything? They clip along at a very fast pace. Not only that, Tolstoy uses a one sentence summary to set up what’s to come. This technique helps you, as a reader, to understand where you are, who’s involved and what’s about to happen. Short words – when he starts to expand on his main idea, he uses direct, everyday language. The world’s greatest novelist doesn’t try to impress you with long words. His aim is to clarify what’s happening in as few words as possible and avoid muddying the waters with abstract terms or pretentious phrasing. Making you run to the dictionary isn’t his aim. Pace – he ties all this together by using a crisp writing style that zeros in on specific items in each, usually short, chapter. Most chapters are less than five pages. This also creates a sense of urgency as you turn from one chapter to the next. Before you notice, you’ve read ten! So, the next time you sit to write a business document, consider opening with a one sentence summary that distills what’s about to follow. This also helps you, as a writer, see what needs to come next. Tip: writing one line summaries is another practical way to beat writer’s block. Using short words also connects you to the reader as this is the language most of us use. No-one says ‘procure’, they say ‘buy’. Root our pretentious phrases and words designed to impress others. It doesn’t work. They see what you’re up to. As a proposal writer, I’ve found the greatest success when I understand the subject matter clearly and wrote about it in everyday terms. Likewise, when reviewing proposals, it was the most down-to-earth proposals that made me sit up and pay attention. They made me want to read more. Why? I usually like the writer. And if you’re like me, you probably hate reading ‘marketese’ – that bizarre type of writing that many business writers seek refuge in when they’re afraid to talk to the reader on their own terms. So, make an aim to write with your own voice. Be direct, stick to the point, and tie all the parts together. And, if War and Peace is too much, try Man and Master. 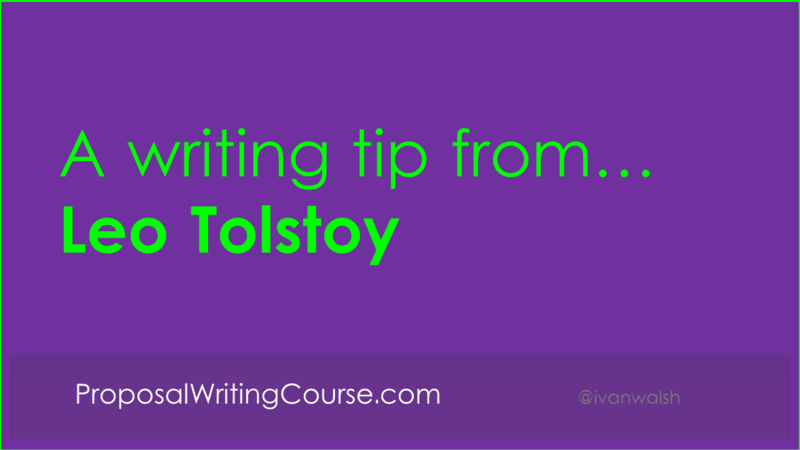 PS – if you’ve read Tolstoy, what’s the one thing that impressed you about his writing?